A portfolio of sigificant commercial sites in Spencer Street in Melbourne's CBD are up for sale, marking the sale of one of the city’s largest development and investment opportunities for 2015. Hume Partners has appointed CBRE Melbourne City Sales to sell what is known as the Spencer Portfolio, which comprises four individual freehold properties with a combined land area of 7,896sqm, offering views to the CBD and Docklands. The commercial properties, 83–113 Batman Street, 371 Spencer Street, 355 Spencer Street and 102 Jeffcott Street, comprise substantial commercial buildings and benefit from existing income in their current form, as well as significant redevelopment potential to accommodate a landmark high rise project. The properties, according to the Australian Financial Review, are expected to fetch between $80-90 million on the market. One of the major offerings is the 3,830sqm corner landholding at 83-113 Batman Street. The property has recently received permit approval for a twin-tower residential project comprising 522 apartments designed by world renowned architect, Bruce Henderson. The other major offering within the portfolio is 355 Spencer Street - a six-level 7,385sqm office building positioned on a 2,003sqm corner landholding intersecting Jeffcott Street. Leased to a range of established tenants including SAI Global and ThyssenKrupp, the property is expected to attract the interest of boutique investment funds, developers and part owner occupiers. 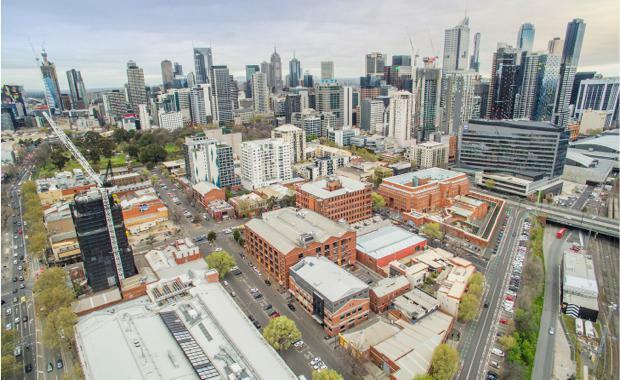 CBRE’s Mark Wizel, who is selling the entire site together with Josh Rutman, Kiran Pillai, Julian White and Lewis Tong, said the property had significant potential to redefine West Melbourne’s residential market. “This site – one of the largest to be offered this year – will transform the landscape at the Melbourne CBD’s western frontier, with the development of a premier residential development repositioning it as one of the city’s most sought after postcodes,” Mr Wizel said. “The diversity of the offering will attract strong interest from a diverse pool of buyers, with its current income offering a secure investment, whilst also holding scope for a number of development opportunities. Mr Wizel said a number of larger state owned enterprises from mainland China were currently in the market with mandates for larger Melbourne sites that provide scale and the ability to stage a project over time. “This includes groups like Wanda, R&F, Poly and Greenland, who have all made public their desire to acquire strategically located sites in and around the Melbourne CBD,” Mr Wizel said. Recent examples of larger land transactions around the edge of the CBD include the Yarravillle Gardens sale for $160 million, Carlton and United Brewery Site for $58 million and the Kinnears Rope Factory in Footscray for $60 million. Driven by the strength of Melbourne’s education offerings, student accommodation providers have also contributed to an influx of activity in the north and western corridors of the CBD, with some record land prices being achieved in recent times. “Scape, Urbanest, Blue Sky and Campus are all recent examples of foreign accommodation providers who have made an aggressive entrance into the Melbourne market,” Mr Wizel explained.